Thirty years ago tonight, on January 26, 1988, Andrew Lloyd Webber’s hit musical “The Phantom of the Opera” opened at the Majestic Theatre on Broadway with a record-breaking $16 million advance, launching a phenomenon and setting a course for history. It cost the Shuberts $1 million just to retrofit the theatre, but nearly 12,500 performances later, 18 million people have seen “The Phantom of the Opera” at the Majestic, raking in over $1.1 billion at the box office ($6 billion worldwide). While the production was almost scuttled in 1987 due to a union dispute over British actress Sarah Brightman transferring from London, it has gone on to employ over 6,500 people in New York alone—125 on a nightly basis, including the largest pit orchestra of any musical on Broadway. “Phantom” won seven 1988 Tony Awards, including Best Musical, and the original London cast album (featuring the same original trio of stars as on Broadway), and its highlights version, are the best or second-best selling cast albums of all time, depending on the source. My grandparents have a copy. To give a sense of tonight’s milestone achievement, when “Phantom” opened on Broadway in 1988, the longest-running show was “A Chorus Line” (1975-1990), then in its 13th year and steaming toward an unheard of 15. Its closest competitor, “Grease”, had run eight years, as had “Fiddler on the Roof” (1964-1972); “Hello, Dolly!” had run six (1964-1970). These were the mega-hits of their time. “Cats” (1982-2000) would break the “A Chorus Line” record in 1997, capping its 18-year run just three years later. Then “Phantom” made history in 2006, claiming the title it holds today and changing the game. While “The Lion King” and “Chicago” have run 20 years, and “Wicked” is in its 15th, “Phantom” has now doubled the original, record-breaking run of “A Chorus Line”, with no end in sight. 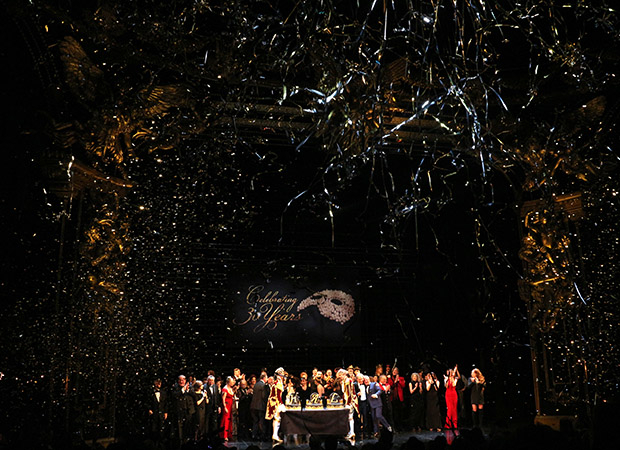 I was fortunate to have the opportunity to attend the 30th anniversary performance of “Phantom”, held two days early, on January 24th, and observe both the show and its black tie audience from a perch in Box 50 (not the Phantom’s coveted Box 5, but close enough). I first saw “Phantom” in 1996, and in recent years have taken a nod from Director Hal Prince—who sees it once a month—by checking in annually. Wednesday night’s gala performance was electric, summoning the same magic I experienced at the back of the mezzanine as a nine-year old kid. 30 years into its run, “Phantom” is still a production to behold, with Maria Björnson’s glittering costumes and sumptuous sets, the infamous crashing chandelier, and a generous ensemble cast of 36. “Phantom” feels unlike any other show on Broadway, its now-iconic stagecraft decidedly old-fashioned, ironically and fittingly, just like a classic production at the Metropolitan Opera. Hal Prince’s sweeping gestures and brilliant use of negative space make the production ten times bigger than it actually is, smartly focus the eye, and keep the action moving at an engaging clip. And Andrew Lloyd Webber’s score, the subject of much mocking criticism in the 1980s, is hauntingly melodic, epically romantic, and simply grand. Like the production itself, the score faithfully stands the test of time, especially in the hands of a tight company led by three stars chosen to helm this milestone cast: Swedish recording artist Peter Jöback as the Phantom, Mexican-born Rodney Ingram as Raoul, and Filipino Ali Ewoldt, the first Asian-American actress to play Christine. At the conclusion of the performance, Andrew Lloyd Webber and producer Cameron Mackintosh took the stage to give remarks and introduce the kids from Mr. Webber’s other currently running Broadway hit, “School of Rock”, who played a special arrangement of the title song with Mr. Jöback and surprise guest star Sarah Brightman (the original Christine) on vocals. Hal Prince then came to stage to share some impressive statistics about the show and introduce alumni from the original 1988 cast, who joined the current cast in a rousing chorus of the Act II topper “Masquerade”. Then three cakes adorned with Phantom masks were rolled out on stage and turned around to reveal the letters H-A-L, a nod to Mr. Prince, and the cast and audience sang “Happy Birthday” to “Phantom” and its beloved director, who turns 90 on the 30th. An explosion of gold confetti and streamers closed out the night at the Majestic, but the party continued at the Rainbow Room at Rockefeller Plaza, and a special light show atop the Empire State Building (though cynically skeptical at first, I have to admit it’s pretty cool). “The Phantom of the Opera” is an accessible masterpiece amalgamation of magical musical theatre elements that has become a phenomenon because it is a phenomenon, and now it holds a singular place in the history of Broadway. It is by no means the greatest musical ever written, but it has captured the imagination and won the hearts of audiences unlike perhaps any other. As I lined up to enter the Majestic with my father (a huge “Phantom” fan) on Wednesday night, the Asian gentleman behind us—unaware that he was about to attend an historic performance—was brimming with excitement. English as his second language, he proudly told us that he had seen the show on Broadway ten years earlier, and was now checking back in to a favorite. And therein is the secret of “Phantom”’s success: it has bewitched audiences for 30 years, and might very well for the next 30. Just sit back and listen to "The Music of the Night".